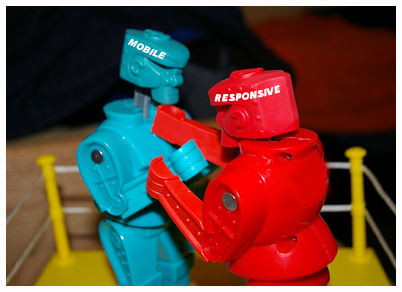 Responsive, hands down…no contest. The debate is over and there’s not much point in arguing about the topic any longer. In a nutshell, the argument among many marketing professionals has been about whether a completely separate mobile site or a site that would respond to different pixel dimensions on different mobile devices was the better approach. We here at TrustWorkz, Inc. have a very strong opinion on the matter and took an official stance in May of this year. We will only be building responsive websites for our clients going forward. We made this sweeping decision based on the data and analytics information that we receive from our client’s websites. We’ve noticed up to a 1000% increase in mobile traffic to many of our client’s websites in just over 2 months’ time! Not having an across-the-board mobile strategy for our clients was no longer an option. With the continued mass adoption of smartphones and mobile devices (and at break-neck speed) in our culture, the topic of mobile strategy has quickly become a priority for anyone with a website. Since our primary goal is to ensure that our clients become “the source” for what they do in their market, Search Engine Optimization (SEO) and content creation are among the primary tasks that we perform on behalf of our clients. How our client’s customers and potential customers are using the web is of great importance to us. It is how and where THEY chose to interact with the content that we create that matters. The world is becoming increasingly more and more mobile with each passing day. We’re here to see to it that all of our clients are progressive and ahead of the curve as the digital space evolves and transforms. Our director, Kevin Ekmark wrote an article on his personal blog about mobile website strategy for small business. Click through and you’ll find out a little more about the need to move toward a mobile strategy NOW! It’s not merely intuition that drives us to make company-wide changes like these. We watch carefully for indications and trends that give us insight into what is happening in all aspects of the digital marketing space. Please see what Google’s official stance is on the matter in their post: Recommendations for building smartphone-optimized websites. Bing has also released their position in their Webmaster Center blog post entitled: Building Websites Optimized for All Platforms. If you are among our valued clients, rest easy. We’ve got you covered. If you’re not a TrustWorkz client yet and are looking for an affordable solution that delivers real results, consider contacting us for a free consultation and we can discuss the possibilities!